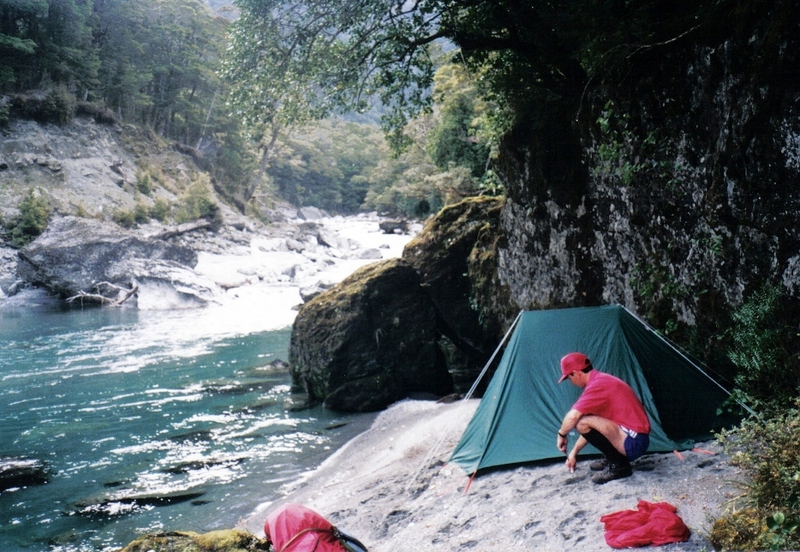 I’ve camped in wierd and wonderful places all over the world and could be considered an experienced outdoorsman. My friends all know it and talk to me if they need advice about where to pitch a tent, what to carry, etc etc. Here are three stories which show why I’m known as such an expert – NOT!!! 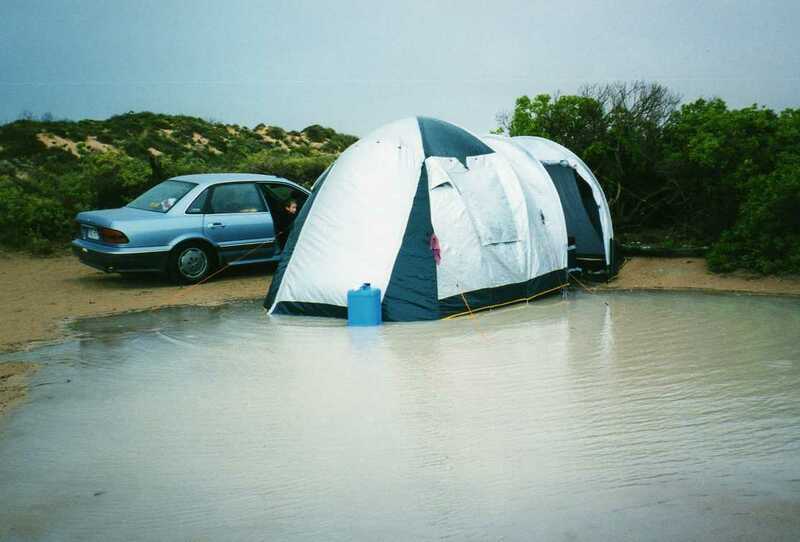 I took my family camping on a whale watching trip at the Great Australian Bight. We camped at Cactus beach and I found a perfect spot for the tent out of the wind. It didn’t look like it was going to rain but rain it did!! Buckets of it! In the middle of the night, our mattress seemed to be floating and when I could finally brave the elements, the rain had stopped and the water had subsided somewhat. This is our tent and the kids have never let me forget about it. The water was up to the car wheels earlier. In my desire to find a spot sheltered from the wind by those bushes I had set up in the lowest part of the site. Clever! We camped in the Clare Valley. Well, it was actually on a hill and we were using one of those old fashioned canvas tents that took about three hours to put up, you know the kind – they weigh a tonne and have steel poles. I didn’t even consider the wind because it was calm when we got there. By the time I had erected the tent it was starting to rain so we finished up and left things and drove into Clare for lunch (typically tough camper that I am!!). The wind rose and the heavens opened. When we got back to the top of the hill the tent was about sixty yards away draped over the branches of a tree in two pieces!! We shoved it into the boot of the car and rented a cabin and thanked our lucky stars since it rained for the next three days. When I proposed to my wife, she thought, like all my friends, that I was the complete woodsman. We honeymooned on the south island of New Zealand. I had spent four months solid ‘tramping’ (Kiwi for ‘hiking’) around the mountains and valleys a couple of years earlier and was very good at it. There was a valley that I wanted to tramp and I convinced my wife to go with me. It would be a four day trip, walk up to a mountain hut at the snow line, stay a day or two and then walk out again. I didn’t factor that at the beginning of the trail we would have to cross a river. No bridge meant wading but the water was deep, all the way up to our armpits. I made two trips, each time carrying a backpack above my head. This river is basically melted snow so we were freezing when we started the actual walk. It was obvious after a few hours that we wouldn’t make it to the hut so we decided to pitch the tent on the banks of the river. We did so about an hour before sundown. After setting up camp, I checked in my bag and found, to my and my wife’s horror, that I had forgotten to pack the matches. I had to explain this to her as she tried to work out how we were going to cook our food, the kind that needs rehydrating. I then remembered I had a compass and this had a magnifying glass on it. I got a piece of toilet paper and aimed the magnifying glass at the sun and the paper caught fire. Yes!! It will all be ok. The paper soon burnt up so I quickly found twigs and branches and set up a fire pyramid, put toilet paper under it, got the magnifying glass out again and watched, in horror again, as the sun sunk below the horizon. We spent the coldest night ever, eating chocolate, nuts and lollies. The next day we met a school group and I begged them for some matches, blatantly lying that ours had got wet!! This photo was taken moments before I realised our predicament. Strangley enough, almost nineteen years later, my wife is still my wife and still goes camping with me. Never underestimate the power of forgiveness!! Enjoyed your tales of Bushwackers Camp. I lived near there for a while in the ’70s, and also witnessed flash flooding with goats being carried away in the wave. We spent many happy hours with Jane Stanton who owned the camp and watched her old black and white clickety click films of the early days when she and her husband Hugh had tame rhinos! We had some amazing times in Kenya and when the cold grey skies of a British winter dampen the spirits it is good to retreat into the memories of a sunshine land of sunny people.